Jason Groome, potential No. 1 draft pick in June's draft. About 60 kids clad in red T-shirts formed a line Saturday afternoon inside Maplezone Sports Institute to greet the ace of Phillies past. For two days this weekend, this sprawling complex in Garnet Valley hosted Cole Hamels, who posed for photos with each camper before one of three four-hour pitching clinics. The potential ace of Phillies future - the tallest one in the room - stood nearby. Jason Groome, a possible No. 1 choice in the draft in June, was a coach at Hamels' camp. The lanky lefthander with a powerful fastball from the Jersey Shore trains two days a week at Maplezone. 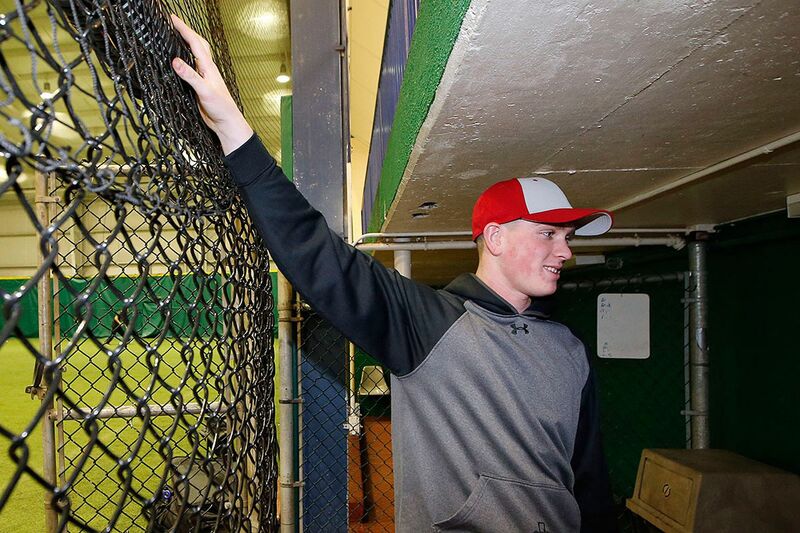 "It's pretty cool," Groome, 17, said. "I wish I was at one of these when I was 8 or 9 years old, learning from Cole Hamels." He's done fine without that, as chatter increases about the Barnegat High product's chances of being taken first overall by the Phillies. And Hamels, who met Groome last spring, is a fan. Hamels, without wanting to put pressure on Groome, has offered himself as a resource. The Texas Rangers ace is friends with Jeff Randazzo, Groome's adviser and the owner of Maplezone. Consider Hamels paying it forward when he introduced Groome to Jim Brogan, a motivational speaker and former NBA player from Lower Merion who has worked with Hamels since 2009. "Obviously, what he's been doing and saying, it helped Cole out a lot," Groome said. "Now I'm even thinking about giving him my number and talking to him before I pitch. If Cole does it, it has to be working." Hamels, whose family still lives in Newtown Square, has monitored the Phillies' rebuilding process. He applauded the strategy of stockpiling pitchers. The Phillies are expected to take a pitcher with the No. 1 pick in an important draft. With the cost of pitching, especially for aces, the draft could be the best avenue for acquiring a top-flight starter. "Even if they don't draft him, he's going to make an impact in the big leagues," Hamels said. "I think he's going to be very good if he goes to Philly." Hamels plans to continue the camp, even as his career has relocated. Close to 180 attended, at $300 per child, and the Hamels Foundation said proceeds will benefit education programs in Philadelphia and Malawi, Africa. Groome said he was happy to mentor some campers. Barnegat's season starts in early April, and the Phillies may have eyes on every single game the 6-foot-7 lefthander pitches as a senior. And, who knows, maybe Hamels returns to Philadelphia in his late 30s to pitch alongside the kid he called "Groomie" on a chilly Saturday in Delaware County.